The time right before Noah goes to sleep is the sweetest time of my day. 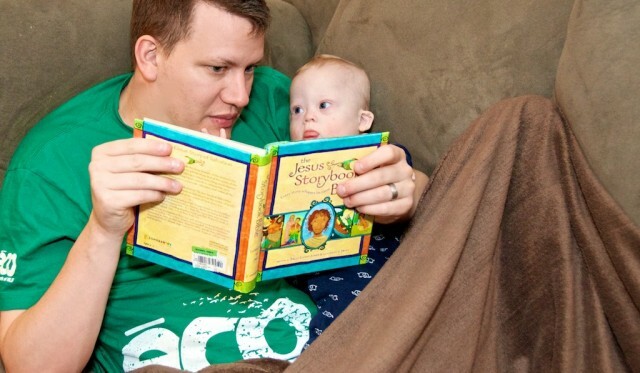 My wife and I take time to hold him and read to him from The Jesus Storybook Bible (which by the way is awesome!) Afterwords we hold his tiny little hands and pray with him. We look forward to it the entire day. It’s such an amazing time we get to share with our child as he is growing up. This is what we call keeping the main thing, the main thing! Before I tell you about the three free gifts any parent can give their child (for free) I want to tell you about of the greatest gifts a child can give to his parents. This gift is awesome, and trust me…you’ll want this gift! One of the greatest gifts a parent receives from their children is the opportunity (and responsibility) to see their children come to know and understand God. 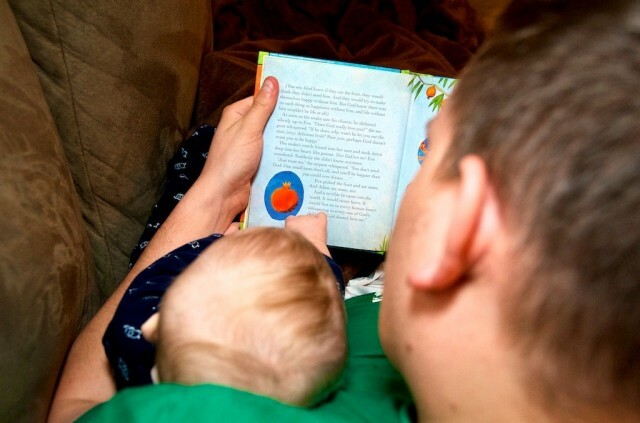 I often imagined what it would be like one day to cuddle up next to my little one and read to him the great historical accounts of how God has worked in centuries past. He is so full of wonder. I love it! Creation. The faithfulness of Noah. The great flood. The splitting of the Red Sea. The passover account. God’s faithfulness to Israel despite their unfaithfulness. The incredible Gospel narratives. The choosing of the disciples, and the great hope that brings to guys like me. God’s incredible conversion of Paul. The understanding of God’s new covenant with us. How we are no longer strangers, but friends of God. How only God can taken something broken and useless, and make it into a Masterpiece. How God completely and totally redeems our life, and gives a joy that few on Earth can totally understand. The story of God is amazing! The Bible is very clear about our responsibility as parents to foster our children’s Spiritual growth (Deut 6:5-9) and trust me when I say it’s a responsibility that brings with it deep joy. It’s awesome how God planned the whole thing out. It’s a gift to us to our children grow in their understanding of God, and it’s a gift to our children to understand God. Amazing! Another crazy thing about all of this is you don’t get your gift before you give your children theirs. In fact your gift is dependent upon giving these three gifts. Don’t worry they’re free! Oh, and trust me. Your kids will like these three gifts even better then an iPad! Prayer time, is a sweet time. When Noah was born I made a commitment to pray for him every single day. Now God isn’t going to get upset at me if I forget, or get a headache and turn in early. I don’t get earn some kind of God brownie points or anything wacky like that (to quote Chris Rock, “You don’t get brownie points for something your supposed to do!) I just know how powerful, and priceless prayer is. When we pray we are showing our dependance upon God. As you pray with your children you are modeling that dependency for them. Children watch their parents like a hawk, and they learn to develop their habits (both good and bad.) As they watch and learn from you the hope is they to would develop a life long attitude of dependance on God. It changes ours (and our children’s life). It’s epic. And it costs you and I nothing (expect some time.) What a great privilege we have as parents to interact with the Creator of the cosmos on our child’s behalf! Do you have a habit of praying with your children? I hope so. Are you giving your child this precious gift? 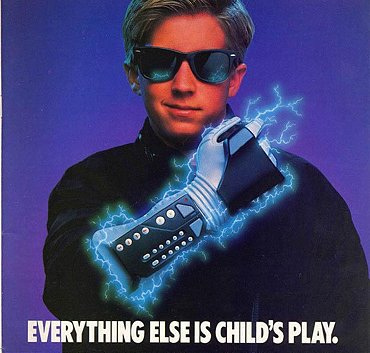 You child wants you even more then a power glove! simply a dad who they can have a relationship with. I would add to that, a dad who is committed to the Spiritual development of their family. Sadly, I don’t have a single childhood memory of my father reading The Bible to me, praying with me, or taking me to church. While I certainly missed out on something special, it was my dad who really missed out. Just make it a part of your daily routine. 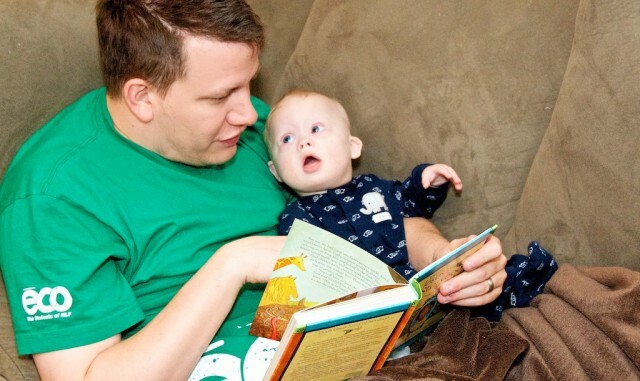 Noah is a baby now, so I don’t have many choices other than to hold him in my arms while we read and pray. As he gets older we’ll certainly change that up. Variety is important in anything, So get creative! As you give your little one year old girl a bath, talk to her. As you scrub his her arm and legs remind her that God created those little limbs. That she was made in the very image of God, and that God specifically and purposely knitted her to together in her mommies womb. Remind her that she is greatly loved by God. My favorite time of the time. I know there are lots of parents who are already living this out, and to you say, keep it up! Your investment now will reap great dividends that will stick with your children for the rest of their life! For others, this is an area that has been a struggle. You haven’t been consistent with your walk with God in your own life. Guess what? With God (as long as you are still living) it’s never to late! You may have to apologize to your children for not stepping up and fulfilling your God given responsibility to develop them in their Spiritual journey. However, it’s worth all of the hard work. Your life (and your children’s) will never be the same. There’s no perfect family, and no two families are the same. God is interested in telling a very unique story through your family. A story He isn’t any telling through any other family on this planet. He wants to use your family. Your story. In a way you will never understand this side of Heaven. No matter what your past five years (or past fifteen years) have been like why not make a commitment today to invest in your child’s spiritual journey. Turn the tv off. Unplug the internet. Shut the phone down. Do whatever you have to do to be certain you (and your child) don’t miss out on one of the best gifts a parent could ever give a child; a parent who helps cultivate their child’s spiritual journey. You can do it! In fact God created you to do it. And I promise, even though they may not know it now, your children will come to appreciate these three free gifts more than any i device. I promise. I have a daughter who has a genetic disorder and her prognosis is similar to that of a downs child. We just found out 4 months ago, and she will be one year old soon. It has been a very hard time for me, and as a Christian, it has been very hard to press into God. I found your blog last night, and I have not been able to stop reading through your posts. Thank you for being transparent, for being faithful, for using this blog as a medium to educate everyone about DS, for sharing your faith through this process, and for posting on a consistent basis. I really do thank God for you and your family. It encourages me to look to the Lord as I walk through this period of my life. Thanks so much for your post! God wants to tell a very unique story through your family, so stick it! I honestly don’t know what to say. I am not a religious person and I do not believe in god. I personally can not agree with what you wrote because it is something that I dont believe in. I think that this post is your opinion and that it is good that you pass on your beliefs to your child as you find them to be important in your life. I like your blog and ready the journey your family is going through. 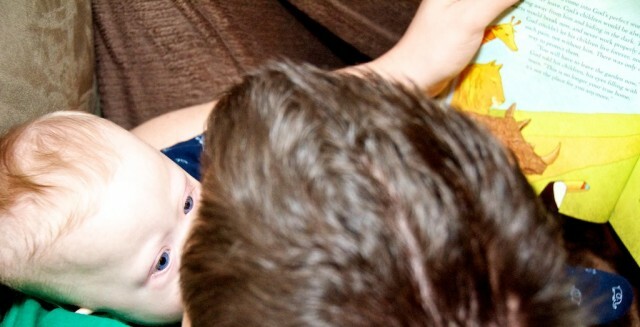 My daughter is 19 months and she has Down Syndrome as well and I am always interested in other families journeys! Thanks of your comment…and your honesty! Rather I’m “helping” him come to know and understand God. Most parents skip out on this all together. That’s sad. When you say you “don’t believe in” the things I said, was there anything specific? Do you have any personal “beliefs? or thoughts about God? LOVE this post! I started reading “The Shack” (i know some people don’t like this book) to my kiddos tonight. they are loving it. after the first chapter my daughter asked that when she prayed if she could call God “pappa”. This is by far the BEST blog yet! First, I want to let Chris Spradlin know that we both LOVED “THE SHACK” and my mom is reading it right now. Great book! Noah’s Dad, you did a great job writing this blog and making me think. I long to make sure God is a part of everything we do in life. Although I am not perfect, I try. It is a lot simpler than most people think as you explained. Noah is so very lucky to two very loving, Christian parents who truly care about their child’s well-being. We have such a tremendously special life and we thank God every day! Our little man with DS is blessing us every single day! All you’ve got to do is live day by day, hour by hour and find new, and creative ways to help your children (and your family) grow in your walk in God! Prod of you Vanessa, you guys are rocking! Keep it up! Every night we brush Andrew’s teeth, read a story from Jesus, The Storybook Bible and then pray with and for him. You are right; it’s the sweetest time. So awesome. You guys sound like great parents! Hello My name is kayla. We have a four year old.little angel that was given to us by god. 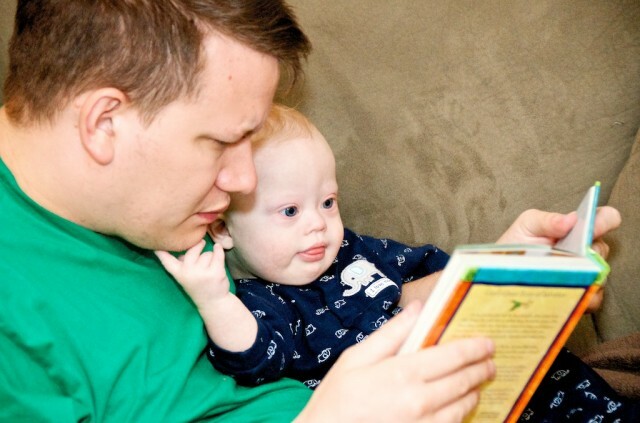 He was born with down.syndrome and esophageal atresia. We spent almost two years in the hoapital. It has been a long.haul but I wouldn’t have it any other wiay. He is My universe. I can’t wait to keep coming back to read more. I started reading “The Shack” (i know some people don’t like this book) to my kiddos tonight. they are loving it. This made me cry. I am so pleased to have met you online and have christian parents to get advice and support from. This is just the most wonderful thing in the world. Keep up the awesome job! Love, love, love!!! Words to live by! My grandaughter Lydia loves the cedarmont kids video’s, we have watched and listened to these songs so many times that when we are in the car listening to them her teenage cousins and there friends are singing along. See how god is already using Lydia to witness to these teenagers. I think her favorite of these videos is the christmas one, she loves away in a manger. You should if you haven’t yet introduce Noah to these music video’s he will like them. I am not bragging just stating facts. My four children have been in church nearly every Sunday since the day they got out of the hospital after they were born. We read devotions to Timothy after dinner each night. He is 22 and so has a really good understanding of things in the Bible. When he recognizes something that is said that was read during the devotion, be it the Bible or the devotion he grins or winks one eye or gives throat sound. He can talk but he prefers to listen. He can also read his own devotions. He loves church. That is his greatest love. He goes twice on Sunday morning if he can. He likes it that much. He goes to adult Bible Class. He doesn’t want to go to Sunday School anymore. He shares his love of Jesus to everyone he meets. At his “Skills” Center he has invited some of his peers to go to church with him. He is disappointed when they don’t show up but we keep telling him to keep trying. I left this part for the very end. His daddy is a minister. Not at the church where we attend right now. He is semi-retired so that he can help me take care of my mother. I don’t mean to sound like everything is rosy. He has stubborn moments, like all kids, especially his age. Well I guess I should stop rambling on. Maybe more later. We try to teach our kids to love others by having them pick out one item at the market to give to the hungry when we do our family shopping. At the end of the month, we drop a box of food off at the local food bank. I also take them to visit the nursing home where I occasionally work about 2-3 times a year to drop off handmade cards or flowers. Love your blog! Our story is almost identical to yours. Olivia is about 6 months younger than Noah. We love reading, too! Goodnight Moon has been a favorite. We just got Phil Smouse’s My Big Book of Bible Stories. It is a hoot to read! You don’t know how many life’s you touch everyday. You don’t know how proud and confident you make us feel. I sing my daughter a song everyday : a thousand words , speciall the lines darling don’t be afraid I have loved you for a thousand years, I’ll love you for a thousand more. thank you for this post because of your posts about noah n your graduation and closeness with god you have opened up my eyes n heart to god once again i had lost it wheni lost my son jake but i have regained my love for him again n share god with my two little ones who he placed in my care .thank you to you n abby for sharing your life n your son with all of us and continue sharing the wonderful word of god with us to. hugs to noah such a sweet lil gift from godwho maks so many smile daily .